In October 2018, the Curatorial & Collections Department accessioned a beautiful Bamboo & Peony transferware platter into the Montpelier Collection. This Davenport pattern matches the dessert plates and a number of serving vessels on display in the Madison dining room and pantry. Bamboo & Peony Platter, MF2018.10.1. Photo by Larry Bouterie. 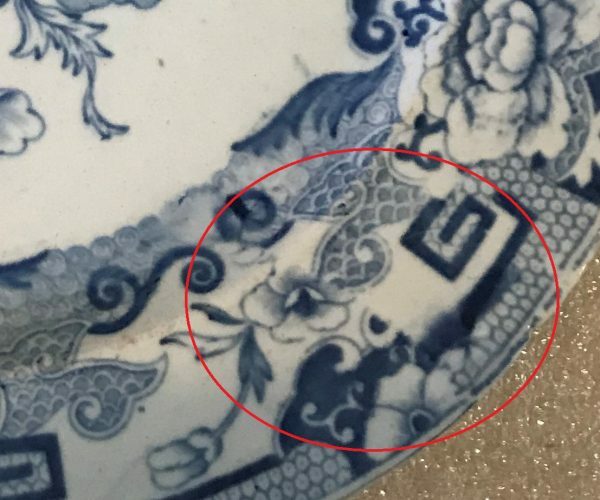 Thanks to the incredible work of the Archaeology team at Montpelier, pieces of Bamboo & Peony transferware were discovered near the Madisons’ home. Archaeological evidence such as sherds, middens, and material remains help to determine what material culture was present at Montpelier during the Madisons’ time. 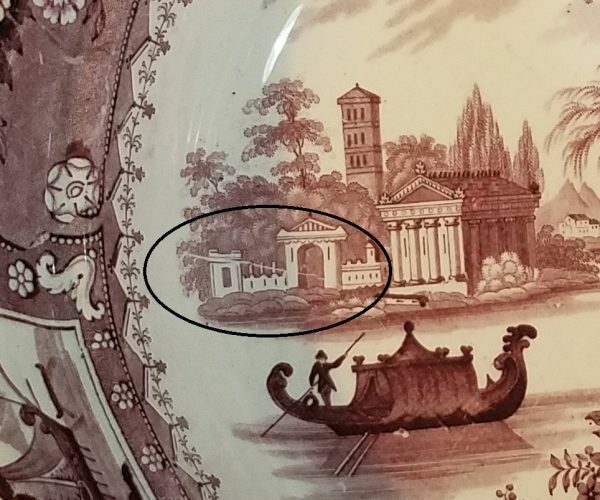 The sherds of Bamboo & Peony discovered onsite provided the Curatorial & Collections team with evidence that James and Dolley Madison used this pattern in their home. Sherds of a Bamboo & Peony plate found at Montpelier by the Archaeology Department. The imagery on transferware ceramics is created by first engraving a pattern onto a copper plate. The plate is then inked and the pattern is transferred to a piece of tissue paper. The inked tissue is then very carefully applied to the surface of the ceramic. When the tissue is peeled off, the inked pattern remains. The object is then fired to set the ink. A purple Canova washbowl in the “Longport” pattern, MF2018.9.1. Due to the tissue paper’s light weight, smudging and wrinkles can occur during the transfer. The line seen on the above purple Canova washbowl is the result of a crinkle in the paper during the transfer. The condition of the overall transfer would determine if this single flaw would render the entire piece a first or second quality product. 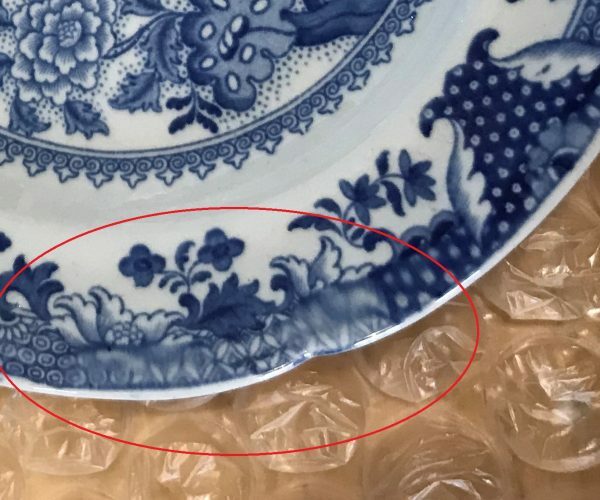 A blue and white Davenport plate in the “Bamboo & Peony” pattern, MF2018.4.9. The blurred sections on the rim of the above Bamboo & Peony plate is an example of a mistake in the glazing process. Second quality pieces such as this would have been shipped to the American market. As the Madisons did not travel overseas, it is fitting that Dolley would have purchased such a piece for Montpelier. A blue and white Mason plate in the “Blue Pheasant” pattern, MF2018.4.13. The seam seen on the above Blue Pheasant plate is not necessarily a flaw, but rather a testimony to the art’s human touch. In order to fit the paper pattern to the object, the inked tissue is cut and the ends joined. The result is the mismatch of different sections of the pattern. This latest platter joins two others on display in the Dining Room. During their time at Montpelier, the Madisons were entertaining extended family, government officials and their families, and guests who wished to meet the former president. Such a large number of visitors required an extensive dining set, including serving vessels. When furnishing a room, our goal is to interpret the space in a way that would most authentically represent how the Madisons lived. Having multiple serving platters on display is a way we can show how busy Montpelier was during the Madisons’ lifetime. Bamboo & Peony dessert plates with gilt edges, MF2018.2.1-5, MF2018.4.1-2. The above Bamboo & Peony dessert plates can be seen on the 17th-century Federal maple inlaid mahogany sideboard in the dining room. Unlike the newly acquired platter, these dessert plates feature a gilt rim and a gilt band between the inset of the plate and the rim. Image courtesy of The Montpelier Foundation, A National Trust Site. On the above mahogany sideboard, all three platters on display in the Madison dining room can be seen. Although all have the same blue and white Bamboo & Peony pattern, the platter on the right was made specifically for serving meat. The piece features a gravy/meat juice well on the proper left side and veins that aid in draining the fluids to the well. A functional design like this demonstrates the multitude of forms that serving vessels can take and is representative of the volume and style of meals that Madison’s would have had for all their guests. Bamboo & Peony platter maker’s mark, MF2018.10.1. Each object that is accessioned into the Montpelier Collection for interpretive use in the House, such as this newest platter, aims to elevate the feeling of being at home, with the Madisons. From sherds found by the Archaeology Department to the investigation done by Research, to the interpretation of the room by the Education Department, every object is a testimony to the many minds that make Montpelier the center for history that it is today. “Archaeology and Chinoiserie Ceramics .” Chinoiserie: Printed British Ceramics in the Chinese Style 1750-1900, by Richard Halliday and Loren L. Zeller, Richard Halliday & Loren L. Zeller, 2018, p. 9. Wiggins, Pamela. 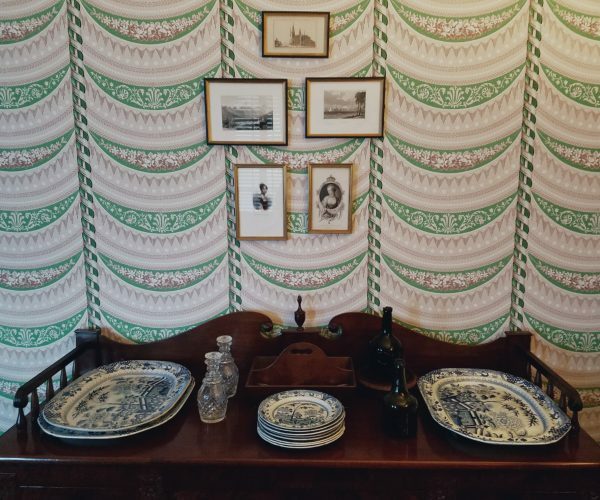 “Transferware: A Timeless Decorative Art.” The Spruce Crafts, TheSpruceCrafts, 13 Jan. 2019, www.thesprucecrafts.com/transferware-timeless-decorative-art-147949. Schafer, Leanna. “Re:Transferware Question.” Message to Leslie Bouterie. 16 January 2019. E-mail. “Return to ‘Books and Farm, to Tranquility and Independence’.” The Madisons at Montpelier: Reflections on the Founding Couple, by Ralph Ketcham, University of Virginia Press, 2009, pp. 14–24.